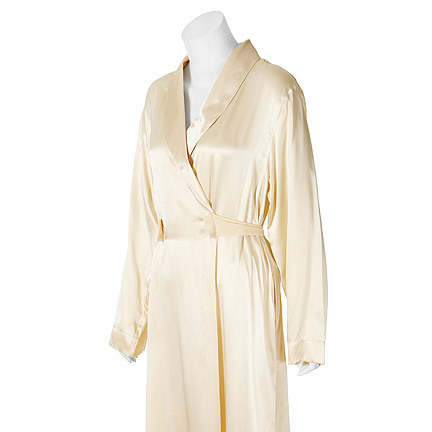 This robe was worn by the character “Deena Jones” portrayed by actress and singer Beyonce Knowles in the 2006 musical film “Dreamgirls”, co-starring Jamie Foxx and Eddie Murphy. 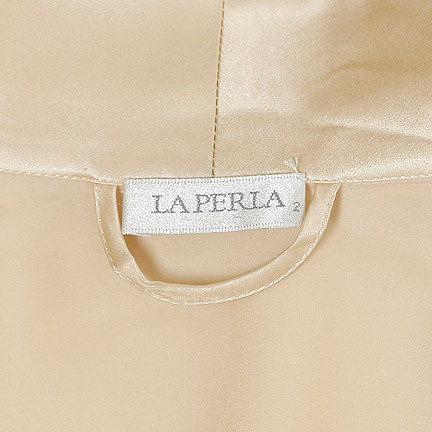 This full-length LaPerla ivory robe has a silk shawl collar, a slit on each side, an ivory chiffon self-belt, and cream buttons on the front left and right sides. 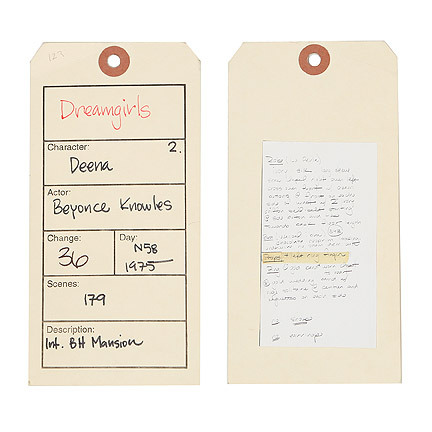 Attached is a costumer tag with “Dreamgirls, Character: Deena, Actor: Beyonce Knowles, Change: 36, Day N58 1975, Scenes: 179, Description: Int. BH Mansion”, typed and handwritten in red and black ink on the front. 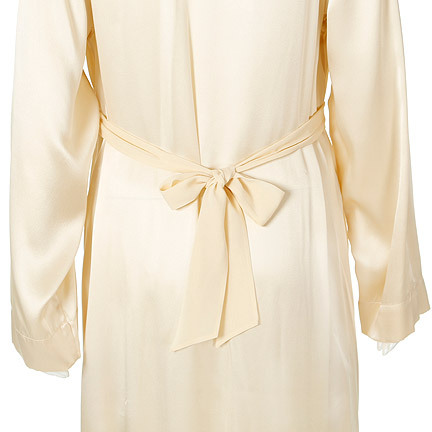 On the back is written: “Robe (La Perle), ivory silk, long sleeve shawl lapel, right over left cross over front w/ cream buttons @ front on each side of waist 2/ 2” ivory chiffon self-belt starting @ side button and ties towards back, floor length, Bra (Wacoal bra) 34B, chocolate neoprim looking, underwire no seam demi cut, Props: *left ring finger, Ring: 1 gold band worn closest 2 gold wedding band w/ huge solitaire @ center and baguettes on each side, no shoes, no earrings” handwritten in black ink. 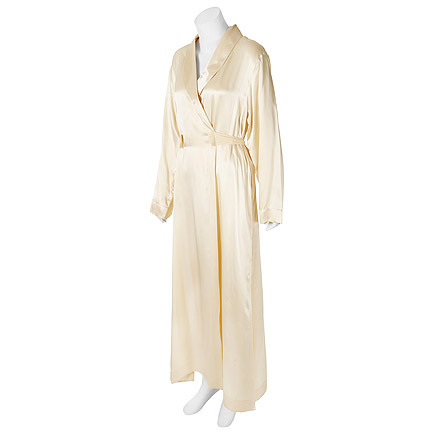 Ms. Knowles wears this robe after a fight between Deena, and her husband and manager “Curtis” (Jamie Foxx). After the couple fights about control over Deena’s career, Deena sings the song “Listen” in a recording studio while we see a montage of her going through Curtis’s desk in his home office, and discovering evidence that he willfully destroyed the career of “Effie White” (Jennifer Hudson), Deena’s former colleague. 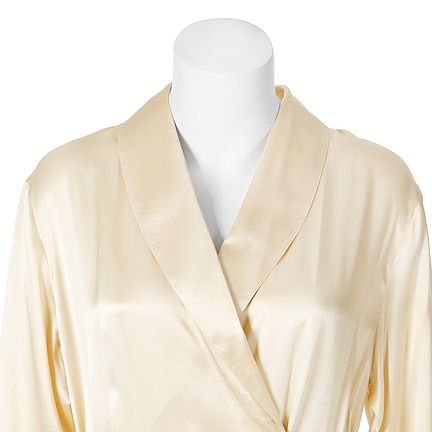 Ms. Knowles wears this robe during the montage, while tearfully picking up the phone and calling Effie to tell her about Curtis’s manipulation. 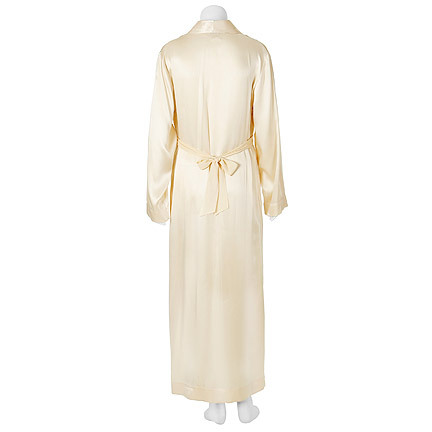 This item is in excellent condition.